The first part of this report can be read here. I walked into Concourse D of Washington Dulles International after my first flight in a CRJ-700. The signage around was very clear, and directed me towards gate D15, opposite to which was the departure point for the shuttle, which they call the "Mobile Lounge". A flight information display near the departure point confirmed that my flight would depart from Gate "A1B" itself, as mentioned on the boarding pass. Head straight for the shuttle..
You get your shuttle here.. This gate for Concourse A, please.. There were six gates for shuttles, two each for a shuttle - one shuttle each for concourses A/B, main terminal and gate "Z" (if I remember correctly). The shuttle, oops! Mobile Lounge! was to depart in three minutes. I walked into what looked like a waiting lounge - sideways seating, with lots of place to stand. I was not sure if I was in the correct place, though. In about three minutes, the lounge started moving! It was one huge mobile vehicle - it appears like some mars rover - huge tyres with a large rectagular body on it. It can be driven both ways. The mobile lounge uses the taxiways marked for aircrafts and appeared to follow instructions from ground control. This is how the mobile lounge looks like.. The lounge had to wait for a while for an incoming Korean Air B777 to taxi past to its gate. 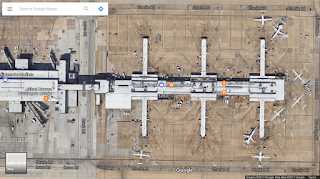 The large shuttle then moved towards it docking point, located around the mid of concourse A. To the right of the shuttle gate were the lower level gates, and to the left were the regular jetway gates. The lower level gates were a modification of the bus gates back in India. The different here being the passengers walk straight to the aircraft. Each gate had provision for docking about 5 aircrafts, and the last two gates (rather, the first two gates) could accomodate 6 aircrafts each. A covered enclosure takes the passengers closer to the aircraft, from where one could walk a few yards to the aircraft and board using stairs attached to the aircraft. Gate 1 through 6 in concourse A seemed exclusive to United Express - it was like a bus station with departures happening in quick succession in banks and the waiting area was terribly crowded for most of the time. Those are gates A1 to A6, as seen on Google maps. A1 is on the right, top. The waiting area near Gate A1 was quite crowded and I found a place near Gate A2 instead. While sitting there, a United airways staffer came around with "Gate Checked in" tags and went about tagging all bags that were larger than a backpack - my carry-on was tagged as well. As the departure time came closer, I headed to a nearby restaurant to pick-up a sandwich for my lunch - a little pricey, but I had one of the best sandwiches I've eaten. As I was about to finish my sandwich, the first boarding call for my flight was made (1216hrs). A little later, I took joined the queue. Boarding happened with the usual protocol of preboarding, then boarding groups 1 and 2. While waiting for boarding, I just called up my host in Rochester and updated that my flight was on time. Carry On luggage - gate checked in! Boarding in progress for two flights - one mine, and another to Syracause..
Two flights were boarding at the same time, from the same "gate" - one was mine, and the other was a Q200 to Syracause. The agents at the gate double checked every boarding pass to ensure that the passengers were heading to the correct flight. The boarding pass was scanned at the gate - the terrible quality of printing at the kiosk meant the agent had to manually enter my sequence number and process my boarding. It was a short walk from the boarding desk to the actual gate. My gate by A1B, and an agent at the gate checked the boarding pass once again and confirmed I was headed to the correct aircraft. It was cold, c-o-l-d, outside. A trolley was placed near the stairs to leave the "checked-in" carry-ons before boarding. I did spot a few smart-joes board with large carry-ons, only to deplane, leave their bags in the trolley and board again! Gate A1. The small doors are "sub-gates". That is N842HK, which would take me to Rochester, NY. Trans States Airlines, written in bold. I was really excited to be flying an Embraer Regional Jet ERJ-145LR - a type that I haven't even seen earlier! 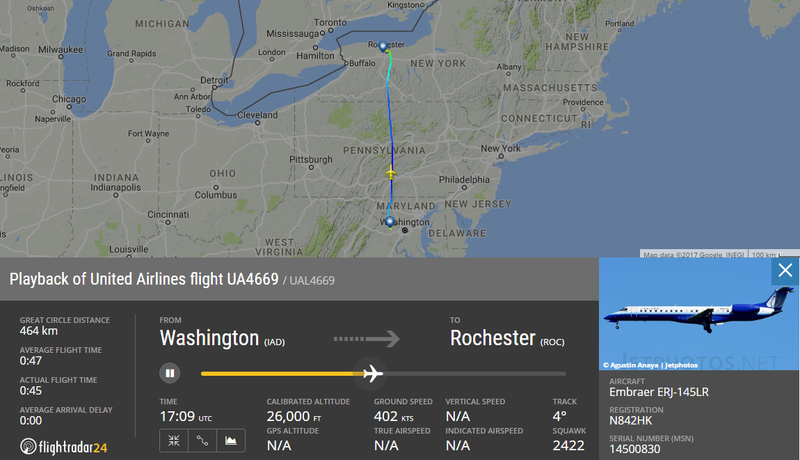 Flying me today to Rochester was N842HK, operated by Trans States Airlines for United Express. This bird (cn:14500830) was delivered to Trans States Airlines in July 2004, and has been flying for United since then (except for a year in storage, in 2016). The aircraft did not wear a livery - white fuselage with a plain blue tail, and "Trans States Airlines" in bold on the fuselage. I walked into the aircraft by 1221hrs. This was perhaps the smallest airplane I've been in. The 50 seater aircraft seated passengers in a 2+1 layout. The seat row numbers were unique - they had seats from rows 1 to 11, then skipped numbers from 12 to 17, and then continued from row 18 to 24. My seat (#19A) was over the wing. The seat was a little narrow - not as narrow as the B748i though. Leg room was sufficient. Overhead storage was a premium - nothing except a backpack or maybe a hand bag would go in there. Boarding was completed by 1225hrs. It wasn't a full flight - perhaps 90% loads. It took a while before the doors were closed. The ground staff were busy finishing paper work for our departure. The door was armed at 1236hrs and we were pushed back at 1239hrs. The Rolls-Royce AE3007s came to life and spooled up as we were being pushed back. The engines sounded a little different. The sole flight attendant on board made a welcome announcement, and switched on the pre-recorded safety announcement. She performed the demonstration, and invited attention of all passengers to the safety information card. We started taxi at 1241hrs. It was one long taxi, as we traveled all the way from stand A1B to the holding point of runway 30! We had another aircraft ahead of us, and a United B777 right behind as well. The B777 intimidated us a couple of time as we lined up for departure (1250hrs). While waiting for departure, the commander came on the PA system and announced that we would have a flying time of a little over 40 minutes, and we were expected to land into a sunny Rochester! The safety card, and my boarding pass..
We took off from Runway 30 at 1252hrs - heading straight to the north-west, before turning to the north and setting cruise towards Rochester. We climbed up fast, and the seat belt sign was turned off at 1302hrs. Soon after the seatbelt sign was off, the FA pulled out the trolley and commenced beverage service. She was quick, and infact served everyone with a warm smile. I opted for a Ginger Ale, which came straight out of a Seagram's can, topped with ice. Unlike the international segment, the beverage is served in glasses, and not the whole tin. A packet of Savoury Snack Mix was given along. The seatbelt sign came on by 1317hrs. The commander announced a little later that we would be landing in another 15-20 minutes, and we should expect some showers at Rochester! It was really cloudy as well. Some Ginger Ale and the Savory Snack mix to go with..
As we exited the cloud cover, the town of Rochester (Pittsford, actually) came into sight. We slowly flew over downtown Rochester. The iconic Kodak Tower, the high falls, and the iconic triple-steel arch bridge (Frederick Douglass Susan B Anthony Memorial Bridge) came into sight. We did a 270 deg turn around downtown Rochester and aligned to the landing path for Runway 22. We finally touched down at 1338hrs. Soon after we touched down, the FA announced that we would be taxiing for another 10 minutes, and requested all passengers to remain seated till the seatbelt signs were turned off. We exited the active runway through taxiway A2, and then taxi'd all the way back to the apron. We docked at gate #B6 by 1346hrs. I remained seated for a while - since I'd anyways have to wait for my "checked-in carry-on" at the jetway. I was out of the aircraft by 1350hrs, and my carry one came by 1354hrs. It was a little long walk to the main terminal, and then down to the baggage reclaim. My bag was among the first to come out - I got my bag by 1401hrs, and walked out of the airport - to Rochester, my home for a month! Downtown Rochester. High falls at the left, bottom. Catering: Irrelevant - its just a glass of Ginger Ale and a snack packet! 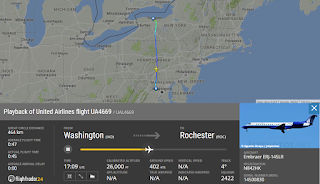 The second flight on United Express, third in United group and the third domestic flight in the US. This was my first in an ERJ145! It was a perfect no-nonsense flight that took me from Washington to Rochester safely. The sole FA on board put up amazing service - serving every single passenger with a smile. All the listed beverage options were available, and although a shorter flight than my earlier sector from CMH to IAD, she let passengers choose their beverage of choice, and not just force down a glass of water to everyone. The Savory Snack mix is a good product - it has most flavours - the bland mini pretzel twists, sweet honey roast sesame sticks and the spicy cheese corn sticks! Overall, it was a good flight!